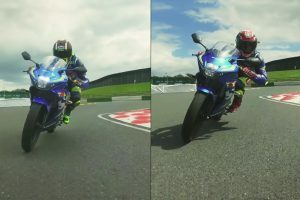 Bennetts Suzuki’s Taylor Mackenzie and Richard Cooper have gone head-to-head in a new video released by Suzuki, taking on a series of challenges onboard Suzuki’s new GSX-R125 and GSX-S125, ahead of their hotly-anticipated arrival next month. 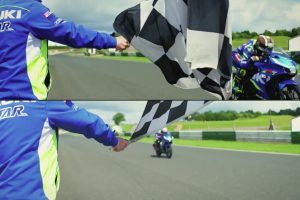 Three-time British Superbike champion John Reynolds was on hand to keep Mackenzie and Cooper in check on the day and to adjudicate, as the pair tackled the Mallory Park circuit on the GSX-R125, while also seeing who could launch and stop it the quickest. On the new GSX-S125, the duo also had to prove themselves by seeing who could wheelie for the longest distance, and then negotiate a tight section from a moto gymkhana course. Watch the video to find out who won. Promising the best power-to-weight ratio and acceleration performance in the 125cc sportsbike class, the new GSX-R has been produced with the same dedication as the rest of the GSX-R range that has seen over one million bikes produced in a history spanning more than 30 years. Setting the new GSX-R apart from many of its rivals is the use of a double overhead camshaft engine design (DOHC), which improves airflow at higher engine rpm and makes for more precise valve timing. There’s also a slim chassis design which helps the GSX-R125 achieve the lightest weight in its class, tipping the scales at just 134kg and aiding in agility and handling performance. The new GSX-S125 also benefits from the best power-to-weight ratio and acceleration performance in the naked 125cc street bike class, using the same, GSX-R developed 125cc engine, which can achieve 122.82mpg. Both bikes will be in dealerships in September, with the GSX-R125 being launched with an RRP of £3,999, while the GSX-S125 will be launched with an RRP of £3,699.